PRAGUE -- It's almost impossible for Dallas Stars forward Tyler Seguin to remember all of the 130 goals and 282 points he scored in his five NHL seasons. But he certainly remembers the first one. It happened far away from home, in Prague, Czech Republic. In the same arena where Seguin has come back to play at the 2015 IIHF World Championship as one of the stars for Canada. "I remember I scored my first NHL goal here in Prague, in this arena, which is kind of cool," Seguin said after he and his teammates first showed up at O2 Arena on Thursday. "That was kind of a cool feeling to walk in this morning. I've been here to Prague before, it's a great city and I'm looking forward to walk around and see it again. But although it's a beautiful city, I didn't come here just because of some scenery. I came here to win gold and do the best for my country." His first NHL goal could have a 10-10-10 code, since it happened in Oct, 10, 2010. It was in his second NHL game, each of those first two taking place in Prague as a part of the 2010 NHL Premiere series in Europe, in which his Boston Bruins played the Phoenix Coyotes. Phoenix won the first game 5-2, but Seguin's goal helped Boston win the second game 3-0 and get the Bruins on track to their most successful season in recent years, culminating in June 2011 with winning the Stanley Cup. Seguin scored 11 goals in 71 games that season and 67 points in the next season. He helped the Bruins to get to the Stanley Cup Final once again in the shortened 2012-13 season before being traded to the Stars on July 4, 2013 with forward Rich Peverley and defenseman Ryan Button for forwards Loui Eriksson, Reilly Smith and Matt Fraser and defenseman Joe Morrow. In his first season in Dallas, he had a career-high 84 points. This season, he ended up as NHL's seventh-leading scorer with 77 points in 71 games. But despite the Stars scoring 261 goals, second-best in the League, they didn't make the Stanley Cup Playoffs and Seguin accepted an offer to play for Canada at the Worlds. "I did a lot of research on this tournament. I know it's pretty big over here," he said. "Back home it's usually all about the playoffs. But when you have a chance to represent your country, you can't say no. I definitely wanted to experience that this year. I'm happy to be here and I'm excited about this tournament." The excitement could be seen Friday in the first game against Latvia, which Canada won 6-1 after jumping out to a 3-0 lead in the first period. Seguin didn't score, but he skated well on the second line with Claude Giroux (Philadelphia Flyers) and Tyler Ennis (Buffalo Sabres) and seemed to enjoy the extra room on the bigger international ice surface. "It's definitely an adjustment," he said. "When we played the exhibition game against Austria, you could see you kind of forgot where all those different spots were. But I used to play in Switzerland for a few months with Patrick Kane in Biel, I had great time and I loved playing on that ice. I'm definitely a skater and that's one of my biggest strengths, so I enjoy it and I like playing wing on this ice." Canada wants to bring home gold from "The Golden City" of Prague and its roster with eight members of the 2014 Sochi Olympics team and big names like Stars teammate Jason Spezza, Sidney Crosby (Pittsburgh Penguins), Taylor Hall (Edmonton Oilers), Nathan MacKinnon (Colorado Avalanche) and Giroux looks like it can make that happen for the first time since 2007. "We came here to get gold," Seguin said. "I think we have a very good lineup on paper. You can have bunch of star players, but it's about how you're going to mix it together and how is this going to click. It's not too much about individuals, but about all of us here." Seguin thinks Canada has enough speed and skill to be able to beat the European powerhouses like Sweden or the Czech Republic on home ice in the round robin. 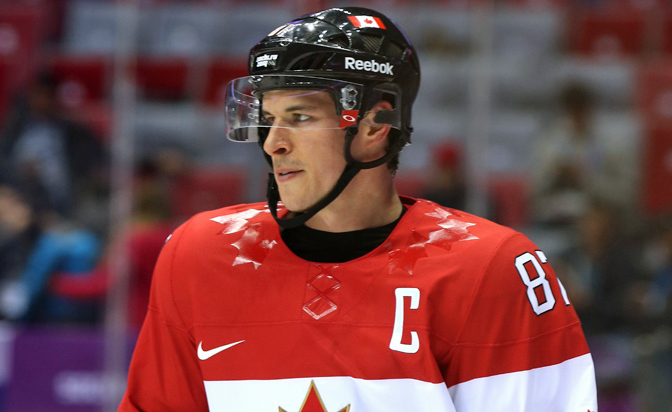 And with Crosby's leadership, he believes Canada can make it all the way to the final and win the tournament. "When I heard (about Crosby playing for Canada), I was excited. Obviously, it's no secret he is one of, if not the best player in the world," he said. "Anytime he comes over to your team, your chances are going to improve. I was really excited. He is definitely a good guy and a great leader in our locker room."